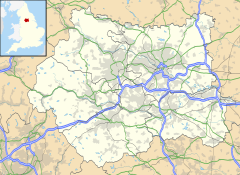 Armitage Bridge is a village approximately 3 miles (4.8 km) south of Huddersfield, in the Holme Valley, West Yorkshire, England. It is situated between Berry Brow and South Crosland and straddles the River Holme. The village has a public house, a cricket club and a renowned ukulele shop. The village is dominated by the large former woollen mill of John Brooke and Sons, reputedly the oldest family business in the country, having been founded in 1541. The mill has now been converted into the Yorkshire Technology and Office Park. The local church is St Paul's and it was built in 1848, with a donation from the Brooke family. Partially destroyed in 1987, by fire, and rebuilt the same year. The church's current clergy is the Rev Stephen Gott. Armitage Bridge Cricket Club in the foreground. Village and Brooke's Mill behind. ^ Douglas, Joanne (18 October 2016). "Holme Valley will be alive with the sound of banjos this weekend". Huddersfield Examiner. Retrieved 14 November 2017. ^ "Heritage | Brookes Mill". www.brookesmill.co.uk. Retrieved 14 November 2017. ^ Examiner, Huddersfield (11 January 2012). "Family History: Exhibition on woollen industry, Brooke's Mill, Armitage Bridge". Huddersfield Examiner. Retrieved 14 November 2017. This page was last edited on 14 November 2017, at 12:27 (UTC).